NEW 8-1/4-inch Tall Bigger than LIFE SIZE - Huge Lexor Gothic VAMPIRE Monster Ghoul Zombie SKULL with Lighted Eyes in a most eerie way... Don't let him posess you!!! White-washed Light Gray SKULL with Purple Glitter Eyes and spooky LED lights seeking to posess you!!! Lexor is unique and sure to turn heads at your haunt! Lighted eyes are set in deep creepy eye sockets, and pulsing purple glowing LED's stream out of his gaping mouth from inside his hollow dense foam skull. HUGE SIZE measures 12-inch (30cm) long x 6 1/2-inch (16.25cm) wide x 8 1/4-inch (20.63cm) tall. 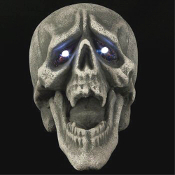 *See the new model Lexor Light Up Skull on YOUTUBE! Supernatural Halloween Haunt Castle Dungeon Prop Decoration Detailed BODY PART. This skull is truly inspired by fans of Twilight, True Blood, Vampire Diaries, Being Human, Underworld and Buffy the Vampire Slayer! One of this year's favorite skulls, Lexor is unique and sure to turn heads at your haunt! HUGE SIZE measures 12-inch long x 6 1/2-inch wide x 8 1/4-inch tall. Requires 2 AA batteries (INCLUDED) with hangtag. *See Lexor Light Up Skull YOUTUBE!